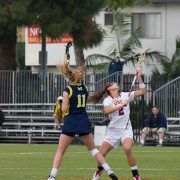 Senior women’s lacrosse attacker Michaela Michael earned the honor of MPSF Offensive Player of the Week for her performance from March 20 to 26. This is the seventh time that Michael has earned the honor for her offensive play and the eighth overall time that the senior was honored with a weekly award from the league. She also earned a rookie honor in 2014. 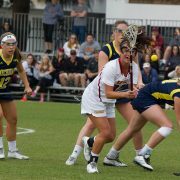 In her two games last week, Michael netted eight goals while racking up seven draw controls, three ground balls and two caused turnovers. 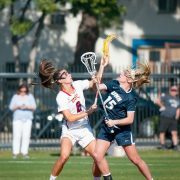 Six of those goals came from her performance against Ohio State, which was her third career game with six or more goals. The Ohio State match also notched the 32nd hat trick of her career, the best in program history. 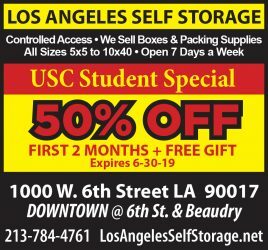 As a team, the Trojans have now earned 28 different weekly awards from the MPSF. Eleven of those awards were for offensive players, while 10 were given to defenders and seven were awarded to rookie honorees. Throughout this season, the team has received five weekly honors so far. 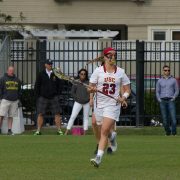 USC will return home to McAlister Field on Friday after playing four games on the East Coast. The team is ranked No. 9 in the nation after a 7-3 start to their season. As they seek to remain perfect in the MPSF, the Trojans will host Fresno State on Friday, then face off against Cal on Sunday.